What are the Main Health Benefits of Using a Massager? 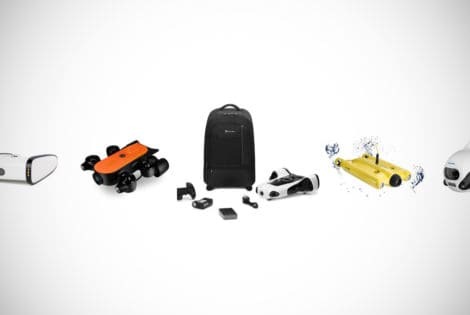 What’s So Special About the Brookstone Brand? How Well do Brookstone Massagers Work? Massage Those Aches and Pains Away! Have you ever got to the end of the working day or week and just felt ragged and ruined from your head to your toes? There’s not many people living and working in the fast-paced world we have that hasn’t experienced the mental and physical strain of stress. Whether it’s related to where and how you sit all day for work, or reoccurring niggling pains or just stress manifesting itself in areas of your sensitive body, a supposedly ‘satisfying’ week of hard work can leave you feeling more than a little worse for wear. In fact, the pressures weigh down on us from all directions, leaving us feeling that our work, family and social lives are all in cahoots to send us to an early grave. Okay, that may be a little dark, but pressure and strain combined with aches and pains can have a devastating effect on your well-being. Even if you don’t feel strain mentally, you probably feel it physically. Many people, in similar situations, turn to massage and other forms of physical therapy. However, what if your schedule is so jam-packed that attending a salon or making an appointment with a qualified masseuse is out of the question. We’d suggest that you make time for it! But, in the real world, we understand that’s not always possible. Fortunately, the home massage equipment market is thriving right now. Don’t believe us, just look up the term ‘back massager’ or even just ‘massager’ and you’ll be given thousands upon thousands of search results. If you did just do that search, particularly on a site like Amazon, and looked up the most popular devices and gadgets, you’d probably come across a Brookstone massager or two. The problem is, that with so many to choose from out there, how can you possibly decide which is best or not? You let the team here at Men’s Gear handle it. In the following guide you will find, therefore, what we feel are the 14 top Brookstone massagers out there. This massage chair not only provides a full-on Shiatsu-style massage but reclines and rocks to give deep and powerful relief. Portable and lightweight, with a large node that targets those stubborn aches and pains, offering relief all over. 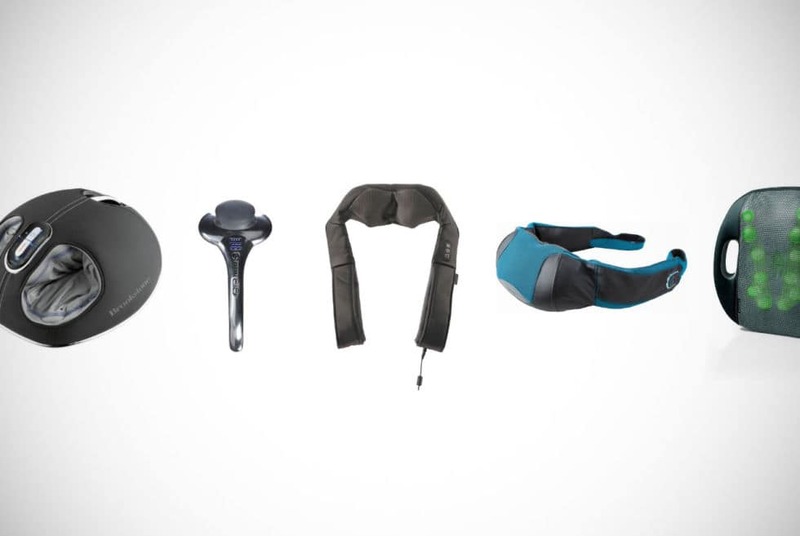 This Brookstone neck and shoulder massager offers a versatile range of options to help your upper areas. First in our guide is this Brookstone Shiatsu neck and back massager. This conveniently designed massager helps to easily relieve tension and pain in tired and tight muscles anywhere on your neck or back. It’s incredibly easy to use – simply slide your hands into the comfortable handles and you’re ready to go. Thanks to the rechargeable battery and cordless design, you’re able to use it just about anywhere without feeling tethered to a mains supply or any annoying cable getting in the way. To hit the spot you need massaged most, you simply raise or lower the handles to place the satisfyingly-deep kneading nodes over the areas that need it most. In total, there’s eight nodes incorporated into the design, all ready to work hard for you. With three different intensity levels to choose from and two massaging mods, you’ll find it easy to find the right setting for your aches and pains. The addition of heat provides your shoulders, neck and back muscles with even more relief. The last thing you’d want when using a massager, like this Brookstone massager is to feel weighed down. Fortunately, it only weighs 4.05-pounds, which is hardly going to add undue pressure. It’s just perfect, in fact, and will leave your muscles feeling as if Kaito or Hinata have worked their expert hands over you. Although a little on the pricey side, it more than makes up for its efficiency and convivence. Next up is this rather awesome Brookstone handheld massager. Again, this benefits from a rechargeable battery and cordless design, but also offers the versatility of being handheld. That means that virtually anywhere on your body, or a partner’s can be massaged until it feels better. With a 3.8-pounds sturdy machine-engineered aluminum body, it’s built to last without feeling too cumbersome or heavy. It can be directed across problem areas at whatever angle with the use of the two ergonomic and conveniently placed handles. As this is a percussion massager, the nodes move up and down giving you a much deeper massage. The versatility of this device is matched by the variety of options you have. As well as the choice of three specific programs for different deep tissue massages, there’s also the option to customize your experience further. You can do this by choosing the massage speed that’s best for you, from 1,750 to 2,550RMS. Looking for a soothing, energizing or maybe even a pulsating massage? This can provide the massage experience you’re looking for. We really like the fact that you can use this device on your own or with the help of a willing partner too. Perhaps you are more specifically looking for the best Brookstone massager to combine with your sporting activities. 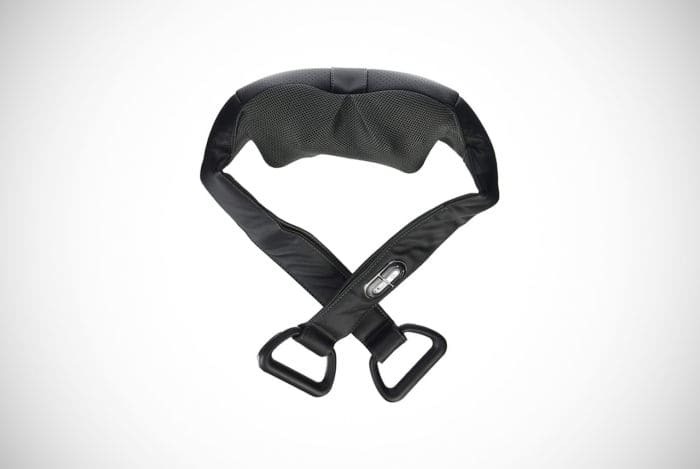 This Brookstone Active Sport Massager is a worthy contender for that kind of use. It has been designed specifically to target your hard-working muscles, whether you’re hitting the gym to buff up or have been training hard for that 10k or triathlon. Although it is not cordless like a lot of the other models in this guide, it offers a lot of versatility in that it features interchangeable nods. There’s a total of three different nodes to choose from – the wide-coverage node for greater surface areas, along with the ball and pinpoint node for greater intensity on precise areas. 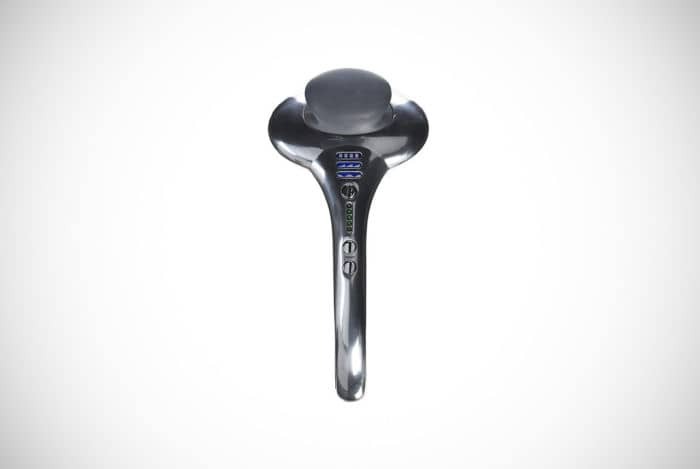 The fact that it’s a percussion-style massager means that it works into the muscle tissue deeper for greater relief. Combine that with the adjustable speed control and you have all you need for the perfect DIY massage after a strenuous workout. As we noted, this is not cordless, but that won’t matter much as it’s got an extremely generous seven-foot cable. What’s more, at just 2.12-pounds it is rather lightweight and easy to maneuver to target the areas where you need it most. 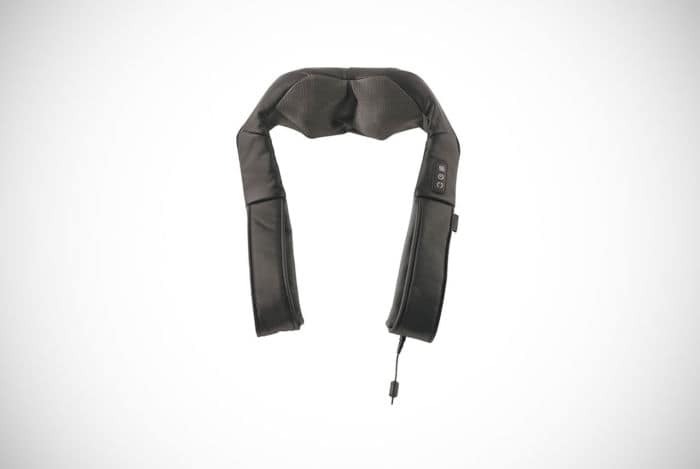 If this looks familiar to the Brookstone Shiatsu neck and back massager we featured at the top, that’s because it is virtually the same device. The main difference between this version and that one is that it is corded, not cordless. Although we’d generally consider the other to be best because it’s cordless, we appreciate that this may be more within your price range if you’re looking to save a little money. Essentially, it’s the same machine though, you’re just tethered to the mains, that’s all. As the above model, it’s designed to target pain and tension specifically in the back and neck region of your body. 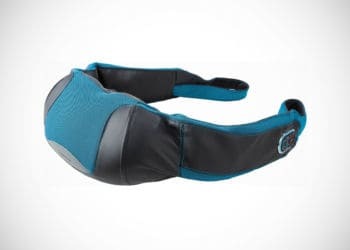 Using it is easy – you just slip your hands into the grips and then slide the strap up and down your body, working the nodes over the troubled areas. There’s eight nodes in total, all ready to work their magic. It may not be a Swedish masseuse named Olga, but it’s the next best thing and more convenient too. In addition to the nodes though, there’s also the option to add a little heat, increasing the effectiveness. The cord aside, the design is still incredibly lightweight. So, you get all the benefit of a great massage, that you can perform on yourself, without adding extra strain and pressure on your muscles. Spend a lot of your feet at work and in life in general? For tired and aching feet, you need the next Brookstone massager in our guide. That is, this Brookstone Shiatsu foot massager with heat. Slip your feet into the holes after a long and hard day or week and allow the dynamic-squeeze air compression and deep-kneading massage rollers work their magic on your feet. What we especially love and we’re sure you’ll love too is the fact that it has a streamlined design that will fir just about anywhere. So, whether you just want to use it at home or take it to work with you, you can benefit from the relief to all that pain and discomfort. Like many Brookstone massagers in our guide you have the choice of three different auto-massage programs – energize, pulse and soothe. In addition to the air compression and kneading rollers, there’s also the element of heat that will help to increase its effectiveness. Although it’s not cordless, it does come with a cord wrap incorporated into the design which ensures your cable is always kept out of the way. As feet are obviously not the most hygienic things in the world, another great feature is the zip-out and removable linings that Brookstone have included into the design. That means you can clean them between uses. Give your feet the attention they deserve. Who doesn’t like to see their money go a little further? Well, that’s what’s possible when you choose this 2-in-1 Brookstone massager. Two in one is very apt, as that’s just what it offers – two popular massage techniques for the price of one. The two massage types are the Shiatsu and Tapping. While the Shiatsu form of massage involved deep-kneading and circular motions on specific acupressure points, the Tapping form is more percussive and involves light-knocking movements. 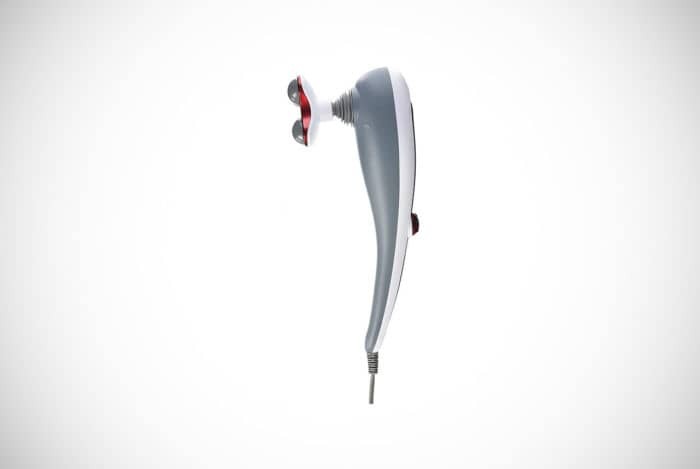 This model is designed in a similar way to the other neck and shoulder and back massagers already mentioned in the guide. You have two handles that you slip your hands into and can move the massaging nodes over the areas you are looking to target. As well as a choice between either tapping or shiatsu, you can also choose to benefit from both at the same time. Therefore, you’ll get an even more effective massage session using it. 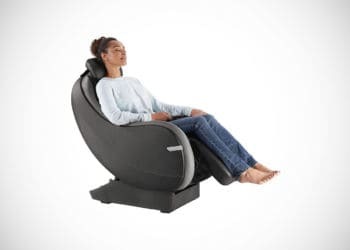 Like many of the top Brookstone massages though, it also has the additional element of heat to give your muscles and all those nasty knots relief. As if that wasn’t enough versatility, you also can choose from three levels of intensity. Do you find there’s that one spot at the small of your back that always feels tight or achy, but unless you go to a massage therapist, you can’t reach it? With this Brookstone back massager, that’s no longer a problem. This model is called a 3D massager because it offers a design that almost-perfectly follows the contours of your back muscles. It has a total of 12 Shiatsu massage nodes that deeply knead at those tired and strained muscles in both your upper and lower back, depending on the way you position it. Although it’s not cordless, it’s designed to fit on your chair, so it’s not really the type of massager you need to move around to get the best use out of it. It does, however, mean that you need to ensure you have a chair close enough to a mains supply. Brookstone have designed the massager to fit in most chairs, so whether you’re planning on using it at home or while you’re at work, you can. The LEDs is perhaps the most curious feature. Curious or ridiculous, but it does help to highlight where exactly the massager is soothing. As a nice extra, the color changes when the direction of the massage program has changed. A must for all desk jockeys and high-flying call center sales reps.
Do you love those massage chairs you often get at gyms, sports centers and some spas? Although it would be great to spend time in one of them, every day, it’s not really an option. Well, not unless you want to take lots of time off work. That is, unless you fancy investing in this rather awesome Brookstone massage chair topper. With it, you can turn just about any chair into a fully-functioning massage chair. 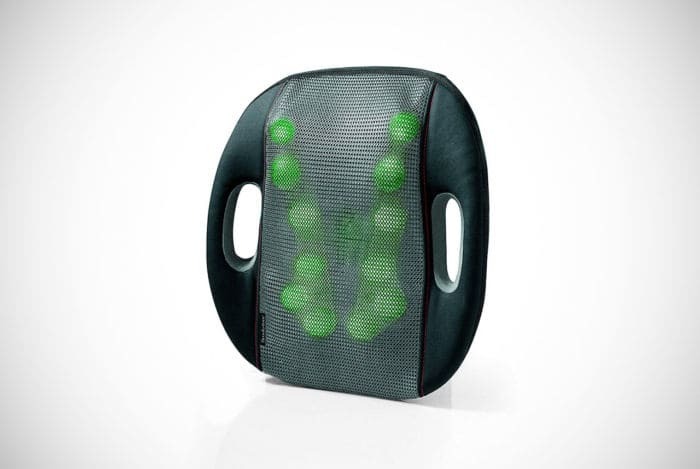 The rolling and Shiatsu nodes work their way over the entire area of your back giving it an amazing massage. It’s also able to target specific parts of your back with precision. A great addition to the design is the dynamic-squeeze chambers of air that sit at the waist and hips contracting and expanding. What is their purpose? To simulate the actions of a professional massage therapist. As well as making you feel better, it also helps to increase your circulation. 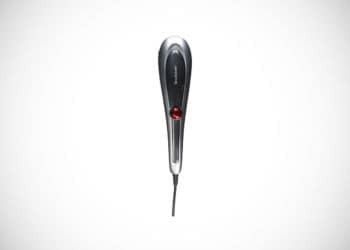 By far, our favorite feature of this massaging accessory is the fact it comes with a remote control. Having full access to all the controls means that you don’t have to get out of your seat to change the different settings. You, therefore, just need to sit back and relax and can switch and change the different zones you want to target, operating the air chambers, switching the heat, intensity and style. Want an incredible massage at work? Get the Brookstone massage chair topper. Whereas the products we’ve featured up to this point in our guide have been small massagers, the next is a full-on Brookstone massage chair. Brookstone are well-known for their high-end massage chairs. If you have very limited space, that doesn’t mean you’re not able to have a massage chair. Not as this specific model, which is appropriately called the Rock and Recline. 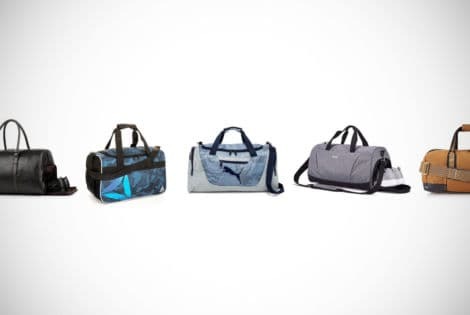 It has a more compact size, but with the same reclining functionality as a full-size model. At the end of a rough day at work, you can come home and sink into the chair and let the Shiatsu, rolling and tapping motions work at your aching and tight muscles. Once settled, recline and the special L-track rollers can work their magic up and down your back and underneath your glutes. You have the option to choose between four effective auto programs, Energize, Stress Relief, Relax and Quick. In a similar fashion to most of the top Brookstone massagers, there’s the option to add heat into the mix when you’re enjoying a deep and satisfying time. The heat helps to work through that tension and increase your circulation, as well as a plethora of other great benefits too. Our favorite feature, without a doubt, though, is the handheld remote control. This means you can relax and switch through the different presets and customize your experience, without getting up out of the seat. Ultimate in relaxation! Sometimes a more cumbersome and bulkier shaped massager is not practical for shoving in your gym bag or taking to work with you for during your breaks. That’s when you are looking for something more portable. Something perhaps like one of the most compact of all the Brookstone handheld massagers, in other words, this mobile sport massager. Thanks to the large percussion massage node, it still manages to pack a suitably calming and relaxing punch, despite being a lot smaller compared to others on the market. Its handheld design makes it relatively easy to maneuver over the parts of your body that hurt the most. So, if it’s leg day and you need to soothe your hard-worked quads or arm day and your biceps are aching, this is the perfect accessory for you. The fact that it’s cordless makes us love it even more, as you don’t have to worry about a pain in the neck cable getting in the way of, well, massaging that pain in your neck. It’s also incredibly versatile thanks to the adjustable speed settings, so you can switch it up a gear for a more intense massage or relax with a slower and deeper one. The penultimate Brookstone massager on our list is another full-on, but still very compact and lightweight (considering) massage chair. 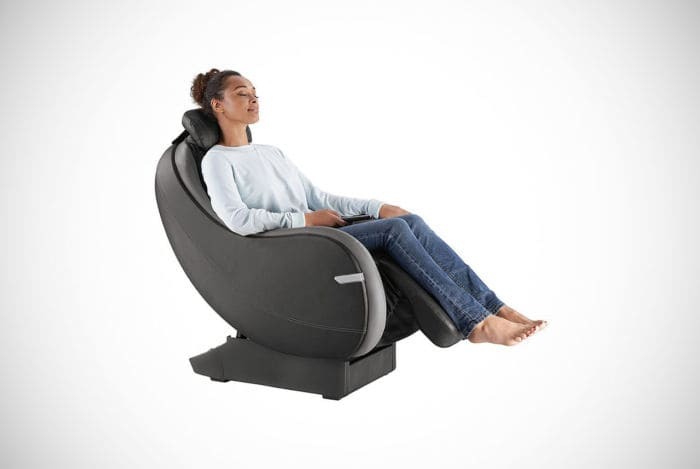 The Brookstone ReAct massage chair is perfect if you regularly have aching and tense muscles that need a little bit of TLC. It doesn’t matter if you injured yourself playing golf at the weekend, or whether it was pulling a muscle on the job or just because you want to chill out in front of some Netflix, the ReAct may be the addition to your home or office you need. This chair features the deep-kneading Shiatsu-style nodes that many Brookstone products are known for. They have been proven to help encourage and stimulate natural muscle recovery, while relieving tightness and soothe those painful muscles. 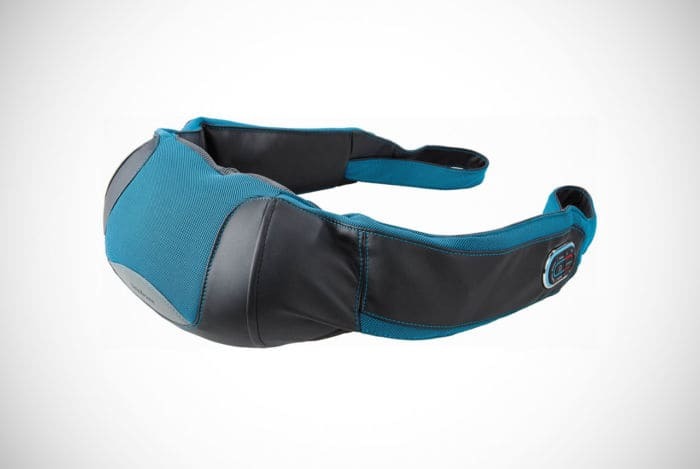 It offers a full-body design with a special L-channel that massages all the way from the top of your back and shoulders down to underneath your thighs in a continuous track. This style of massage helps to send you into a much deeper and relaxed mood. Although there are only two main preset massage programs, for Back separately and Full Body, it is more than enough to really feel the benefit. You even have the option of using the spot massage feature to target areas in more need than others. Heat can also be added to either of the programs to help intensify the experience and results. Don’t want to get up from your seat to change the settings? You don’t have to as they can be located on your right-hand side of the chair itself. 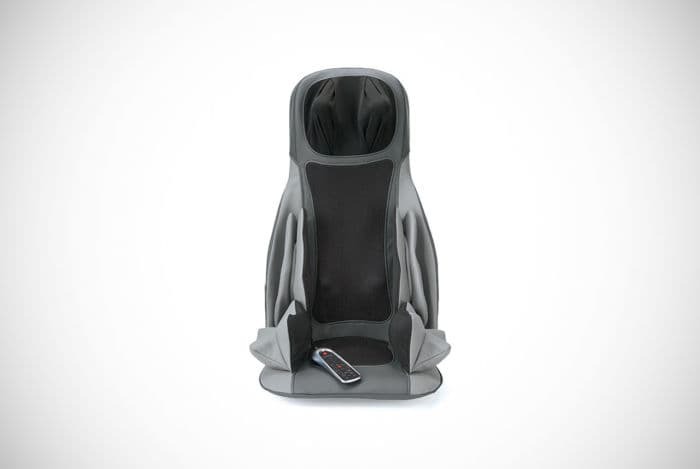 Brookstone have done it again with this chair – not one you should skip passed too quickly. We find ourselves looking at another topper-style massager that can turn even the most unforgiving and anything-but-relaxing chair into the kind of seat that is built for kings. The Brookstone S2 is another massager topper that offers the high-quality shiatsu-style massage we’ve all come to expect from the company and their amazing products. Despite its portable design, the S2 chair topper still features four nodes that move in three directions. That is, back and forth, counter-clockwise and clockwise. This means that you can target any of the three main areas of your back – lower, middle or upper. If that wasn’t enough, the width of the nodes can be adjusted to ensure they’re covering all important and especially needy areas. It’ll come as no surprise when you consider the name that you have the option to add a little heat to the occasion. Heat and massage are general a good combination. Warmth on aching and tense muscles can help relieve them on its own almost as much as massaging them. This chair is perfect if you’ve been longing for a more cost-effective solution to your need for a weekly or even daily massage. Not all of us have the time, even if we have the money, to pay for massages on an almost-daily basis. With the massage chair topper, you pay once and benefit repeatedly! 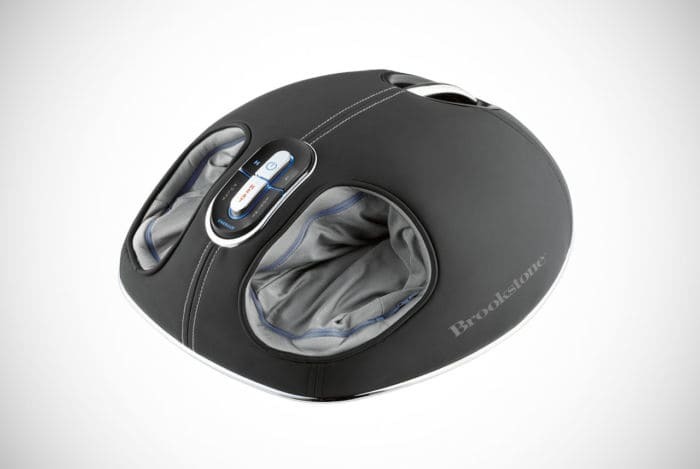 There’s several important things you need to consider when buying a Brookstone massager. However, perhaps the most crucial of them all is, what parts of the body and muscle groups is it designed for? As you’ll have undoubtedly seen from the guide above, there are many different massagers and not all of them are made equal. While some are designed to target your strained muscles and all those knots in your neck and shoulders, others are designed to target the other end of the body – your feet. Choose the Right Massager for the Aches You Feel – With that in mind, you need to be careful to choose the right massager that’s going to help you. If you find you have the most trouble in your feet, for instance, it’d be a waste of money investing in a full-on back and body massage chair. Particularly when you can get a perfectly fine foot massager for a fraction of the price. Likewise, if most of your tension was felt in your neck, a massager designed for the back would be as useful as a chocolate fireplace. So, rather than getting swept up by what the fanciest and most kitted out models have and can do, think about what you need in a massager. Corded or Cordless, How Portable do you Need it to be? – Another important thing you would need to consider is how portable you need your massager to be. Are you planning on taking it to work, gym and just about anywhere else you can think of where it wouldn’t be odd? In that case, a cordless Brookstone massager is really what you want. Then, you can benefit from the stress and strain relief, without being tethered to a mains supply. Want Some Warmth with Your Massage? – Do you really benefit from warming your muscles when relaxing them? In that case, you would be right to consider investing in one of the top Brookstone massagers that feature the option to heat the nods and padding. Cost – Obviously, you should never base any buying decision on just the price alone. You want, for instance, to ensure that you’re not only getting a product that falls within your budget. You Want one that offers you real value for the price tag. Often, the cheapest, particularly when it comes to portable and at-home use massagers, are not going to be the best. That’s not to say that you should spend more than you’re able to just to get the best of the best of the best. You need to take a more balanced approach and look at everything you want in a massager and try and match that criteria as closely as you can. Although there are plenty out there, and reading this, that love massage just for the pampering and attention it gives them, most like receiving massages because of the numerous health benefits. While you could argue that there’s really no comparison between a real hands-on expert masseuse, modern massagers, Brookstone personal massagers, offer the next best thing. You may wonder why, when there’s plenty of other brands to choose from, we decided to focus in on Brookstone and their selection of massage products. You’d be very justified to wonder and think that. The short answer is that they’re popular. But a short answer doesn’t really answer the question. So, a longer and more detailed answer is called for. One of the reasons the team here at Men’s Gear really like the Brookstone brand, is that it’s a sign of reliability. Brookstone have been in the retail business in one form or another since the 1960’s. There’s no way a company can be in business that long and not learn from its successes and mistakes and continue to streamline and tailor its offerings so that they’re the best they’ll ever be. Okay, okay, there’s plenty of ways a company could be in business that long and not better themselves as a result. Brookstone aren’t one of those kinds of businesses. Another thing that draws people to Brookstone and makes the brand so special is their attention to detail, built quality and functionality of their massagers. Simply put, their massagers are often the best-in-class for their kind and far better value than other brands. Take any one of the top Brookstone massagers featured in our guide and you’ll find that they all have sturdy builds, are versatile and have a plethora of different features that makes them that little bit better than others. People see the Brookstone name, think of the highly-sought-after massage chairs that the company does so well, and feel compelled to buy something with the name emblazoned across it. With any type of gadget or accessory like this, that has been designed to mimic or simulate something that a human normally handles, it is not always cut and dry that it’ll actually be effective or not. That’s why it’s important to consult reviews and why you shouldn’t just base what you read in a product description. Some work a lot better than others and it’s not always down to price. We’ve looked at several in the guide above that were really, truly and utterly beautiful. As noted earlier, it’s crucial that you choose the right Brookstone massager for the problem areas on your body. You also need to be aware that there’s a tendency with cordless massagers to not provide the same intensity or speed as their fully corded counterparts. Again, a lot of this is relative. If you’ve only got minor aches and pains, you’ll only need a gentle massager. whereas if you’ve got this strain here and another knot there, you’ll be better with either a larger two-in-one model or one that offers deeper kneading and even percussion massage, in addition to some warmth too. Well, there’s our guide to the top Brookstone Massagers out there on the market. 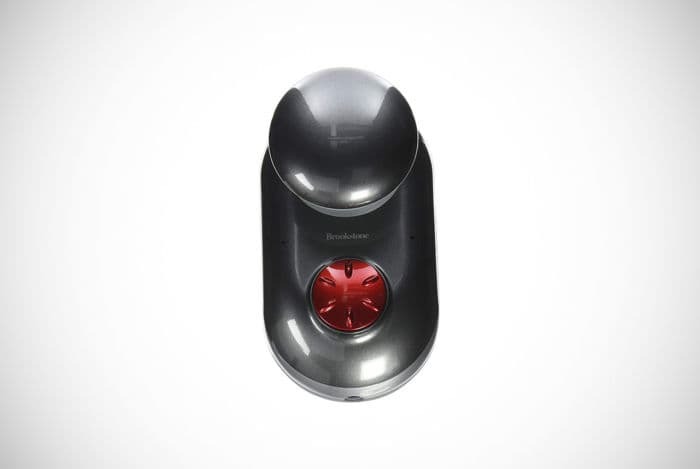 We’re sure you’ll find no other guide to the best massagers released from Brookstone online. We’ve tried to cover all bases – providing you with a rundown of our favorite 12 massagers, along with an insightful buyer’s guide. 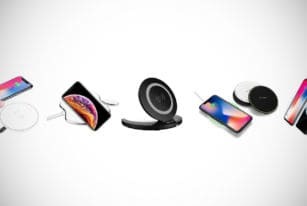 You hopefully have a better understanding of what to look for and consider when choosing from the multitude of Brookstone portable and corded massagers there are available. Furthermore, you should have a better idea of the functions and features you should be on the look for, particularly if they’re relevant to your specific aches and pains. We’ve done everything for you, apart from actually choosing the one you should definitely pick (unless you decide to go with one of the ‘Top Picks’ at the top of the page and if so, we’ll give ourselves a pat on the back and offer you a polite ‘you’re welcome’). That final decision is entirely up to you. The only thing we can definitely say with a lot of confidence is that your brand new Brookstone massager is among the shortlisted selection on this page. 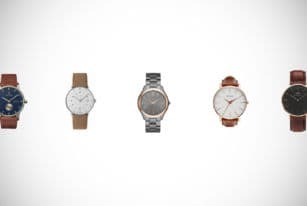 A minimalist watch is the perfect accessory to complete any formal or casual outfit. Never waste time again with the top 24 minimalist watches for men. 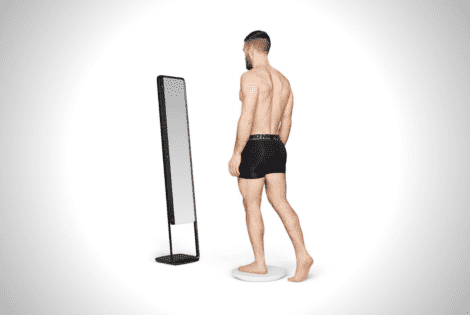 The Naked Home Body Scanner creates a custom 3D model of your figure. It provides historical data and comparisons to help keep track of your body's changes. A portable fire pit it the perfect camping or garden accessory designed to give you fire anywhere. 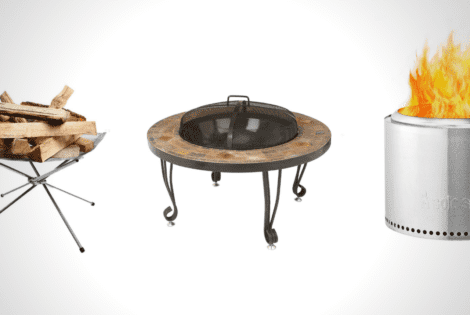 Read our portable fire pit reviews and to see which suits you best.